On Saturday I returned from an 8-day Kilimanjaro trek. 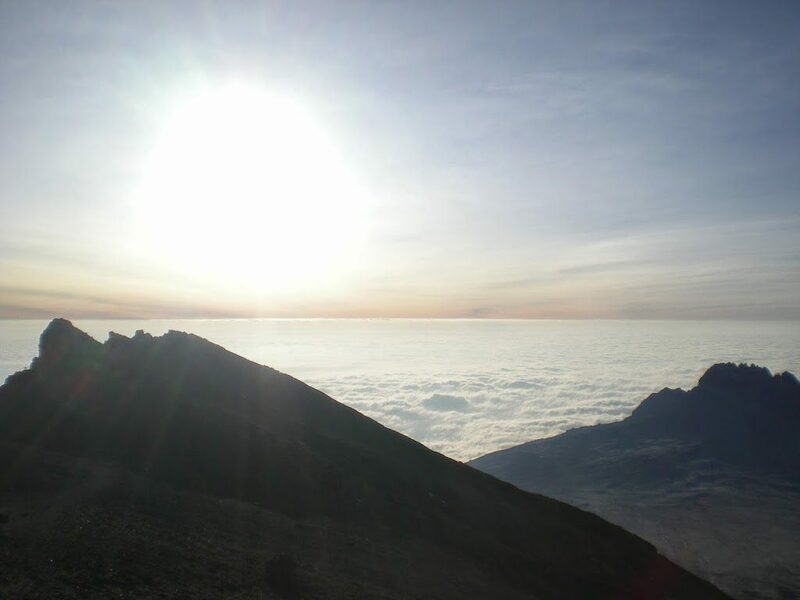 Many of my friends have asked me how it went, so here goes… I also hope that people who are thinking about climbing Kili might find this useful.First of all, I chose the Lemosho route, mainly because it is the longest possible route and therefore excellent for acclimatization. I did not do any specific training before the climb but as you know I run a lot so I wasn’t too worried about not being fit enough. I went trekking in the Himalayas five years ago when doing voluntary work in India, but I didn’t climb very high that time, and apart from that I had no previous experience in mountain-climbing. little bit about the route I had chosen and made sure I had all the necessary equipment. A few things were missing, so they promised to rent them for me. You should expect to pay at least $2,000 plus %10 of the total cost as tips to your guide, cook and porters. If it costs considerably less, it could be that the food and equipment are not adequate or that the porters are getting paid next to nothing. Most importantly, do not choose the shortest route (Marangu) in order to save money, as the success rate of reaching the summit is very low! I was picked up from home at 9am on Saturday. I had booked the trek before coming to Tanzania, assuming that there would be other people attending the same trek. However, in the car I found out that I would be climbing by myself, accompanied by seven members of staff. Unbelievable, right? Seven members of staff just for me! There was a cook, a guide, a waiter, and four porters. To be fair, they were all needed. I mean, you couldn’t imagine the amount of stuff we had! They were not only carrying my luggage and their own personal belongings, but there were also tents, sleeping bags, mattresses (I was expecting something like a yoga mat but turns out they had an actual mattress for me, nice and thick), water, cooker and gas, enough food for 8 days, cutlery, saucepans, teacups, plates etc. And no, they didn’t have light plastic plates which would be quite handy when camping, instead I had a porcelain plate with silver decorations. The first few days of walking did not feel difficult at all. We normally walked for about five or six hours a day, starting early in the morning and having a rest in the afternoon and evening once we had reached the next campsite. I like walking, and the scenery was unbelievably beautiful, so I was really enjoying myself. The only problem was the fact that I was absolutely terrified of getting altitude sickness. And I mean it, terrified! To tell you the truth, I think I was slightly paranoid about it… On the second night I noticed that my heartbeat was really fast, and I was so freaked out that I did not get any sleep that night. It lasted for less than 24 hours, but I was nearly certain I would have to go home. On the fifth day I got a headache. In my mind I was already packing my bags, but to my surprise my guide simply advised me to take painkillers. And I had been so worried, thinking it was extremely serious! Then I found out that you do not need to stop climbing because of symptoms like headache, nausea and vomiting – it is only when you start having breathing difficulties or serious mental confusion that you need to descend. However, altitude sickness needs to be taken extremely seriously (well, you don’t need to be quite as paranoid about it as I was but still!). The truth is, if you ignore the symptoms and continue climbing, you are very likely to die. And many people have died while trying to reach the summit. It is so sad to walk past all the memorial plates for people who have lost their lives there… It is such a strong reminder of the fact that climbing Kilimanjaro is not to be taken lightly! It is challenging even for people who are in excellent shape, and the mountain should be treated with the respect it deserves. On the sixth day we started the most difficult part – the final climb for the summit. We left at 11.30pm after a short nap. It took seven hours to reach Uhuru peak, so instead of sleeping we spent the whole night climbing. It was uphill all the way, and quite steep. It was freezing cold although I was wearing seven (!) layers of clothing, and I had difficulties holding my trekking poles because my fingers were completely numb. I was so sleepy that I was having a hard time just standing up, and the high altitude made my head feel fuzzy. The first few hours passed relatively quickly, but after that I started having serious difficulties. I had to consciously remind myself to move my left foot forward, then the right one. It was absolutely terrible. The hardest thing I’ve ever done in my life! After that it was only an hour’s walk to Uhuru peak. By that time the sun was rising, which made it easier to stay awake, although I felt like I wanted to throw up but couldn’t. I was walking like a zombie, swaying from one side to another, holding on to my trekking poles. But I did it! Reaching Uhuru felt amazing, and the view, of course, was absolutely stunning. However, I was horrified to see a few people looking really sick at the summit, they were literally being carried as they couldn’t walk. Their lips were white and it seemed that there was foam coming out of their mouths, their faces looked a light shade of blue, and they could barely keep their eyes open. How their guides let them go on in that condition, I do not know! I kind of understand why some people who are very close to Uhuru do not want to descend even if they are feeling sick, but I think members of staff should stop them. Only a few years ago three people died between Stella point and Uhuru peak. I mean, it is almost impossible to think about anything rationally at that altitude, but still, nobody should think their life is worth risking just so that they haven’t “wasted” $2000! All in all it was such a rewarding and unforgettable experience. For anyone who is considering doing it, I would definitely say go for it! It might seem like a huge amount of money but it is so worth it, honestly! The best advice I can give is go “pole pole” (=slowly) all the way, descend straight away if you get serious altitude sickness, always keep the battery of your camera/phone (and a protein/chocolate bar) in your bra or pocket and put the clothes you are planning to wear the next day in your sleeping bag for the night, otherwise they will be freezing cold.